When an unloved orphan boy from the circus finds a golden egg, it hatches into a beautiful feathered child whom the wicked circus owner imprisons for money. Despite his fears, the orphan boy recognises the bird-child’s need to fly, and sacrifices his own happiness to set her free. But each night, in his dreams, the bird-child returns to give a feather, until joined together, the feathers become the boy’s cloak of freedom. 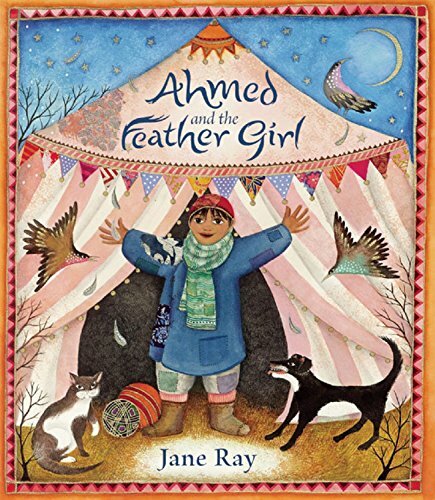 Sometimes the best person to write a story is the illustrator and this is a case in point, for Jane Ray has allowed herself free rein to decorate and embellish magical pictures in her own whimsical way. Each complete in itself, the images tell the story in a gentle unfolding fashion. There’s a haunting pathos in the pictures and the words, a sadness which is steeped in the folk tale tradition, and the story touches us on a deeply emotional level. Like many folk tales there’s cruelty, imprisonment and a yearning for love. But there’s also hope, dreams and the splendour of flying to freedom.